What can you do with a philosophy major? Nothing much…except everything. Some people assume you can’t “do” anything with a philosophy degree. “You’ll work in a coffee shop asking people why they want creme with that.” Others think philosophy is a waste of time. Arthur Koestler said it is “the systematic abuse of a terminology specially invented for that purpose.” If it’s just sharing your opinion – who cares? Still others (like Bill Nye) have no idea what philosophy is. Despite the appearances, (almost) everyone should study some philosophy. A philosophy degree can help you get a good job, earn higher salary than business degree, and find answers to life’s deepest questions. Philosophy has been called “the most practical major”, the “ultimate transferable job skill,” because philosophy majors excel in the job market and earn more money than business majors. Furthermore, all people by nature desire to know (Aristotle, Metaphysics I.1). (1) philosophy can help you toward career goals in law, business, ministry, journalism, counseling, politics, parenthood, education, or academia. (3) philosophy is an enjoyable, fulfilling, human activity – an end in itself. Philosophy majors on average make better money than business majors. They earn more than biologists, psychology, and communication majors. 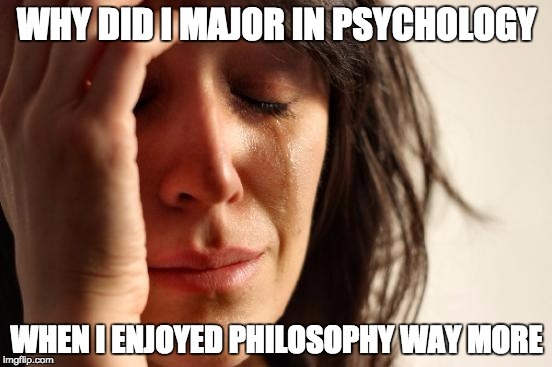 Philosopher majors are #1 for mid-career growth and #16 for median salary at $72k per year. You may never beat the salary of a surgeon, Hollywood star, or best-selling author, but you will always find fun, challenging, fulfilling jobs, and make plenty doing it. — more, in fact, than majors in chemistry, biology, and psychology. Since philosophers learn the “ultimate transferable work skill” they are almost never unemployed. Communication, argument, teamwork, creativity, curiosity are the universal job skills: that apply to every discipline and any working professional, including the most important jobs in the world, being a husband or wife, father or mother, lover or friend. Good philosophy communicates across languages and cultures across generations, centuries, even millennia. A philosophy major means you have spent hundreds of hours reading, writing, listening to, and making arguments in an attempt to communicate clearly. Ideas have consequences. Arguments rule the world — all the practices of government, public policy, business enterprise, scientific advancement, and even religious communities play out in practice the conclusions of good arguments. A philosophy major means you have read and written and understood dozens of dense, complicated, and sophisticated arguments. Every employer, company, family — virtually every human group — lives and breathes cooperative collaboration. A philosophy major means you have engaged in hundreds of hours of careful conversation, problem-solving, and verbal interaction especially in a group. Innovation drives business, law, science, and medicine. While employers are increasingly desperate for it, many educational practices actually stifle our native creativity. A philosophy major means you have spent years encouraging (nay, demanding) the acquisition of the invaluable habit of thinking outside the box. As children, everyone philosophizes. Somewhere along the way, most of us lose that curiosity. Somebody (probably not Einstein) said “Never lose a holy curiosity.” A philosophy major means you have cultivated this innate germ, however small, into a disciplined, reliable skill you can apply to any area of life. Who majored in philosophy? Your professors. But not just your professors. I mean, if studying philosophy is good enough for Han Solo, it’s good enough for you. You can’t say the same for underwater basket weaving. Professorships: This is the obvious, but by no means the only, path a philosophy degree can follow. All of your philosophy professors, and many others (professors of English, law, history, linguistics, public policy, political science, engineering) studied philosophy at some point. Examples: Gertrude Himmelfarb–Historian; Herbert Simon–Economist, and Nobel Laureate; C. Vann Woodward–Historian. Business: The ability to look at old problems in new ways is invaluable in business management, sales, consulting public relations, fund raising, systems analysis, advertising, and banking. Business Management: Good thinkers are better leaders. A philosophy degree can set you on a path towards personnel, financial aid, or public relations, in diverse settings such as college or university, prisons, hospitals, government agencies (county, state or federal), and, of course, the companies we buy from every day. Examples: Carl Icahn–CEO, TWA Airlines; Gerald Levin–CEO, Time-Warner, Inc.; George Soros–Financier & Money Manager. Law: Historically, law was a subdiscipline of philosophy. Laywers make and critique arguments for a living. Law students are famously subjected to a distinctly philosophical form of on-the-spot classroom quizzes known as the Socratic method. Religious & Psychological Leadership: Soul care professionals specialize in the relation between daily struggles and ultimate reality. Aspiring pastors, priests, rabbis, imams, as well as counselors, social workers, therapists, and leaders of non-profit companies can benefit from philosophical training – even philosophical counseling! Examples: Martin Luther King, Jr–Minister & Civil Rights Leader; Madelyn Murray O’Hair–Famous Atheist; Joseph Bernardin–Cardinal; Shaykh Hamza Yusuf–Muslim leader, Arabic scholar; Pope John Paul II—Pope. Sales/Insurance: What is sales but the art of persuasion? Philosophy grads can become successful, agents, brokers, salesmen, sales managers, and marketing directors. Government: Have an eye on public office? Check out the list of folks who started in Philosophy 101 and ended up congressional staff members, in federal agencies and bureaus, state and local governments, the United Nations, foreign service, or cultural affairs. Foreign service & diplomacy: The philosophical ability to discover unconscious assumptions and collaboratively work around them is particularly important when working with people of different cultures. Journalism: Newscasters, journalists, reporters and critics (of books, art, film) have to hone the ability of asking the perfect question and delivering lots of information in a concise and understandable manner. Public service: Both politicians and career public servants benefit from the ability to identify, define and solve (an astonishing variety of) problems. Examples: William Bennett– former Secretary of Education and Head of the Drug Enforcement Agency; Patrick Buchanan– former Presidential Candidate and Political Columnist; Angela Davis–Social Activist and Political Philosopher; Jules Debray–Writer and Government Official, France; Rahm Emanuel–Clinton White House Political Advisor; Vaclav Havel–former President of Czeckoslovakia; Aung San Suu Kyi–Human Rights Activist, Nobel Peace Prize Winner; Robert MacNamara–Secretary of Defense and Head of the World Bank; David Souter–Supreme Court Justice; Carly Fiorina, CEO of Hewlit Packard and Presidential Nominee Candidate. Sports Leadership: Examples: Phil Jackson–Coach, Chicago Bulls; Michael McKaskey–Owner, Chicago Bears; Aaron Taylor–Offensive Tackle, Green Bay Packers; John Elway, Quarterback, NFL; Mick Schmidt–former Philadelphia Philly; Shane Battier – Professional Basketball Player, Duke University. Entertainment: Many directors, storytellers, actors, and comedians studied philosophy to learn the best the human race has had to offer when it comes to creativity, imagination, and hard thinking. Examples: Woody Allen, Alex Trebek, Gene Siskel (movie critic), Steve Martin (comedian), Bruce Lee, Dennis Miller (comedian); Wes Anderson–Filmmaker and Writer (Rushmore, The Royal Tenenbaums); Joseph Chaikin–Theatre Director; Ethan Coen–Filmmaker and Writer (Oh Brother Where Art Thou); Umberto Eco–Novelist and Semiologist; Northrup Frye–Literary Critic; Philip Glass–Composer; Rebecca Goldstein–Novelist; Alexander Solzhenitsin–Writer; David Foster Wallace–Novelist. If you want to play like the best, you have to practice like the best. If one of your heroes is on this list, consider adding a philosophy major or minor to your resume. Perhaps the most compelling reason to study philosophy is that you are a philosopher at heart. You can’t help it. You love it. You are one of us. Philosophy can help you live life and be happy. It can help make you more human. Philosophy is an academic discipline and also a way of life. …philosophy involves the individual’s love of and search for wisdom… this wisdom involve[s] “first and foremost . . . a state of perfect peace of mind,” as well as a comprehensive view of the nature of the whole and humanity’s place within it… attaining to such Sophia, or wisdom, was the highest Good for human beings… by contrast, most people live unwise lives most of the time. Some people are possessed with the insatiable desire for knowledge. Philosophical training, and/or scientific and mathematical training, is one of the best ways to exercise this desire. So go ahead, think about it. Talk to your professor about it. Then, ask hard questions, read hard books, make hard arguments, and find out where it takes you. That’s what you can do with a philosophy major. Edward Tenner, Is Philosophy the Most Practical Major, the Atlantic 2011.